Try, try again. And again...and again... Then try again! 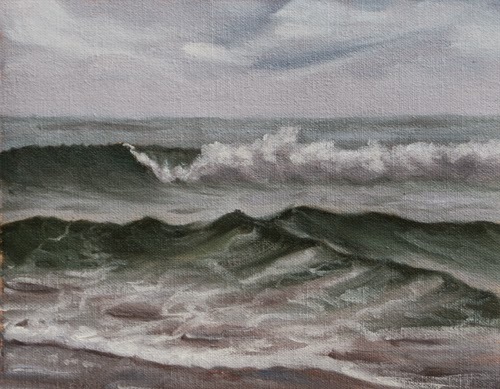 Here is Wave Study #79, painted on Neahkahnie beach today. 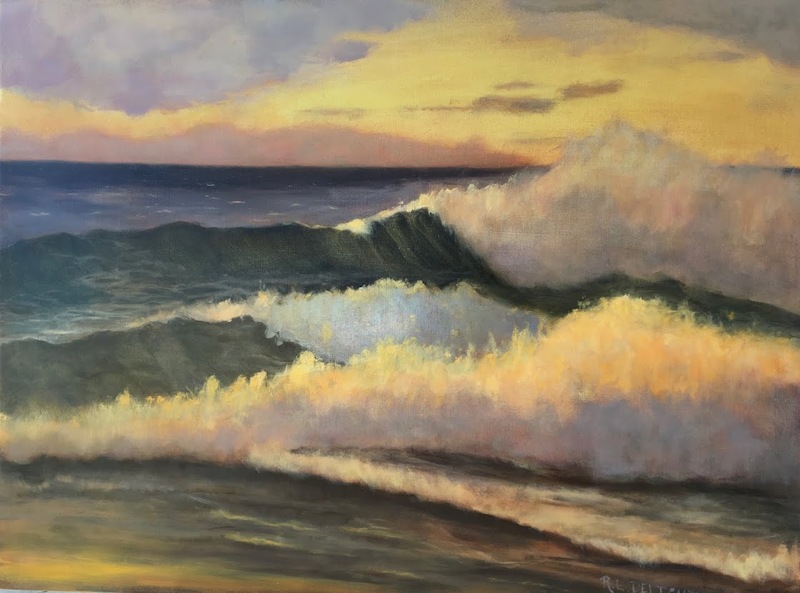 I gained a little understanding from yesterday's wave study and applied it today and gained a tiny inch more in understanding. If the weather is decent tomorrow, I will have to go paint #80 just to round everything out. After tomorrow, the tides will start to be favorable for painting on the other beaches. I would like to get back to Hug Point, Ecola State Park, and of course, Short Sands beach, my all time favorite. I have a couple of new spots in mind too. Our part of the Pacific Ocean is such a green sea. Probably because we don't have the harsh bright sun, except for a bit in the summer. Even when the ocean looks blue the swells are a deep and amazing green. I am pretty close to getting the green right but I would like to get it even closer. It was a beautiful day to paint although the sun was out only for a few minutes. As I was finishing up I kept hearing a crow cawing behind me. Usually I am attuned to what they are expressing and pay more attention but I was a bit preoccupied with painting. When the cawing finally seeped into my painting consciousness I turned around and looked up. I spotted the reason for the crow's scolding. There was one of our resident Bald Eagles perched at the top of the tree looking down on me painting. The eagle ignored the crow and sat and watched for a while before flying off down the beach to look for goodies. I took a picture with my phone. The eagles white head is hard to see against the light sky so I put a circle around it. Today the Bald Eagle was my only watcher, much to my relief. I don't mind people coming up to look but it is nice to have a bit of a break from that. The sun came out as I was cleaning up. Ah well, it all works! Sunshine, Whales, and Bald Eagles!